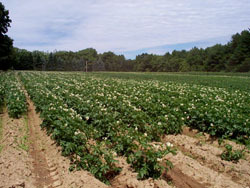 Potato field in full bloom. The mission of the Division of Quality Assurance and Regulations is to provide marketing assistance and consumer protection for Maine's agriculture, industry, and citizens. The Division ensures that a safe, high quality food supply is maintained, that weighing and measuring devices used in commerce are correct, and that standards used in law enforcement are properly calibrated and accurate. The Quality Assurance Program enhances marketing opportunities for Maine companies and producers by ensuring that Agricultural commodities produced in Maine meet or exceed minimum quality standards. This assurance results in increased consumer confidence, fostering an increase in business and profitability.